We’ve made a lot of progress with our poetry client. Our last version (2.0) is using Transports, Protocols, and Protocol Factories, the workhorses of Twisted networking. But there are more improvements to make. Client 2.0 (and also 2.1) can only be used for downloading poetry at the command line. This is because the PoetryClientFactory is not only in charge of getting poetry, but also in charge of shutting down the program when it’s finished. That’s an odd job for something called “PoetryClientFactory“, it really ought to do nothing beyond making PoetryProtocols and collecting finished poems. """Return a poem from the poetry server at the given host and port.""" when the poem is complete. Now we have an asynchronous API we can use with Twisted, so let’s go ahead and implement it. As I said before, we will at times be writing code in ways a typical Twisted programmer wouldn’t. This is one of those times and one of those ways. We’ll see in Parts 7 and 8 how to do this the “Twisted way” (surprise, it uses an abstraction!) but starting out simply will give us more insight into the finished version. So if we wanted, we could take the re-usable parts and put them in a shared module that anyone could use to get their poetry (as long as they were using Twisted, of course). By the way, when you’re actually testing client 3.0 you might re-configure the poetry servers to send the poetry faster or in bigger chunks. Now that the client is less chatty in terms of output it’s not as interesting to watch while it downloads the poems. Figure 11 is worth contemplating. Up until now we have depicted callback chains that terminate with a single call to “our code”. But when you are programming with Twisted, or any single-threaded reactive system, these callback chains might well include bits of our code making callbacks to other bits of our code. In other words, the reactive style of programming doesn’t stop when it reaches code we write ourselves. In a reactor-based system, it’s callbacks all the way down. I’m going to use Twisted! 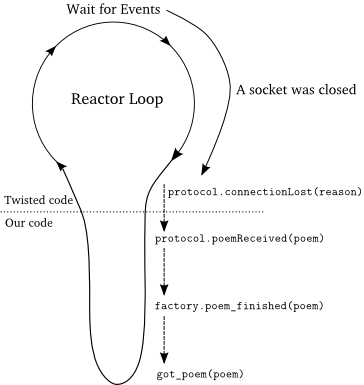 I’m going to structure my program as a series of asynchronous callback chain invocations powered by a reactor loop! Now maybe you won’t exclaim it out loud the way I do, but it is nevertheless the case. That’s how Twisted works. And continue on our way. If, later on, we decided we didn’t really want that poem after all then we’d just snip out those lines and no one would be the wiser. But if we were writing a synchronous program and then decided to use the Twisted version of get_poetry, we would need to re-architect our program in the asynchronous style using callbacks. We would probably have to make significant changes to the code. Now, I’m not saying it would necessarily be a mistake to rewrite the program. It might very well make sense to do so given our requirements. But it won’t be as simple as adding an import line and an extra function call. Simply put, synchronous and asynchronous code do not mix. If you are new to Twisted and asynchronous programming, I might recommend writing a few Twisted programs from scratch before you attempt to port an existing codebase. That way you will get a feel for using Twisted without the extra complexity of trying to think in both modes at once as you port from one to the other. If, however, your program is already asynchronous then using Twisted might be much easier. Twisted integrates relatively smoothly with pyGTK and pyQT, the Python APIs for two reactor-based GUI toolkits. In client 3.0 we no longer detect a failure to connect to a poetry server, an omission which causes even more problems than it did in client 1.0. If we tell client 3.0 to download a poem from a non-existent server then instead of crashing it just waits there forever. The clientConnectionFailed callback still gets called, but the default implementation in the ClientFactory base class doesn’t do anything at all. So the got_poem callback is never called, the reactor is never stopped, and we’ve got another do-nothing program like the ones we made in Part 2. Clearly we need to handle this error, but where? The information about the failure to connect is delivered to the factory object via clientConnectionFailed so we’ll have to start there. But this factory is supposed to be re-usable, and the proper way to handle an error will depend on the context in which the factory is being used. In some applications, missing poetry might be a disaster (No poetry?? Might as well just crash). In others, maybe we just keep on going and try to get another poem from somewhere else. instead, where err is an Exception instance. Using an Exception is closer to what we are used to with synchronous programming. Now we can look at the exception to get more information about what went wrong and None is free for use as a regular value. Normally, though, when we encounter an exception in Python we also get a traceback we can analyze or print to a log for debugging at some later date. Tracebacks are extremely useful so we shouldn’t give them up just because we are using asynchronous programming. Keep in mind we don’t want a traceback object for the point where our callback is invoked, that’s not where the problem happened. What we really want is both the Exception instance and the traceback from the point where that exception was raised (assuming it was raised and not simply created). Twisted includes an abstraction called a Failure that wraps up both an Exception and the traceback, if any, that went with it. The Failure docstring explains how to create one. By passing Failure objects to callbacks we can preserve the traceback information that’s so handy for debugging. There is some example code that uses Failure objects in twisted-failure/failure-examples.py. It shows how Failures can preserve the traceback information from a raised exception, even outside the context of an except block. We won’t dwell too much on making Failure instances. In Part 7 we’ll see that Twisted generally ends up making them for us. instead, where err is a twisted.python.failure.Failure instance. With this version we get both an Exception and possibly a traceback record when things go wrong. Nice. Since clientConnectionFailed already receives a Failure object (the reason argument) that explains why the connection failed, we just pass that along to the errback. Poem failed: [Failure instance: Traceback (failure with no frames): : Connection was refused by other side: 111: Connection refused. That’s from the print statement in our poem_failed errback. In this case, Twisted has simply passed us an Exception rather than raising it, so we don’t get a traceback here. But a traceback isn’t really needed since this isn’t a bug, it’s just Twisted informing us, correctly, that we can’t connect to that address. The APIs we write for Twisted programs will have to be asynchronous. We can’t mix synchronous code with asynchronous code. Thus, we have to use callbacks in our own code, just like Twisted does. And we have to handle errors with callbacks, too. Does that mean every API we write with Twisted has to include two extra arguments, a callback and an errback? That doesn’t sound so nice. Fortunately, Twisted has an abstraction we can use to eliminate both those arguments and pick up a few extra features in the bargain. We’ll learn about it in Part 7. Update client 3.1 to timeout if the poem isn’t received after a given period of time. Invoke the errback with a custom exception in that case. Don’t forget to close the connection when you do. Study the trap method on Failure objects. Compare it to the except clause in the try/except statement. Use print statements to verify that clientConnectionFailed is called after get_poetry returns. Hi Dave, first of all, thanks for yout tutorial, it’s the best I’ve found to really begin to understand the way twitter works. There are some other tutorials around, but they all are totally obsolete and don’t explain the concepts as you, they’re just an exposition on how to do a specific task. And my doubt: viewing the PoetryProtocol code, I’d like to know why do you need to use poemReceived , why not just adding self.factory.poem_finished(poem) to the connectionLost code. Is it done in order to write a beautiful code or is there any need behind it?. Hey José, glad you like the tutorial, and that’s a great question. And you are right: there’s isn’t strictly a need for poemReceived in this case, since the protocol is so simple and our use case is, too. But I like poemReceived for a couple reasons. First, it’s a kind of documentation. It tells the person reading the Protocol implementation about the sort of ‘higher-level’ messages the Protocol is generating from the low-level stream of bytes. And second, it provides a clean place for someone who wants to sub-class our Protocol to post-process the poems as they come in. And by ‘clean’ I mean the method name won’t change even if we update the wire-level protocol implementation. This is a common pattern in the Protocols you find in the Twisted source code. For example, the Protocol that can receive netstrings has a stringReceived method and the protocol that can receive line-oriented text data has a lineReceived method. In both cases the methods raise NotImplementedError to signify that you are expected to sub-class them and override their respective methods. The timeout I have implemented using callLater() but I was intrigued by the Failure.trap() method. Here’s a stripped version of the twisted-intro/twisted-client-3/get-poetry-1.py where I have wrapped the Exception as a Failure and passed it to callLater(). May I ask if what I did is okay? The way you are doing timeouts may not be quite complete. Calling the errback on the deferred will tell the client that the timeout happened, but it won’t stop the poem from being downloaded. And when that finishes, the deferred will be fired a second time (causing an error, since it’s already been fired). So you also need to set the deferred attributed on the factory to None so the factory won’t fire it a second time and close the connection as well. Does that make sense? The latest version of Twisted has added support for canceling deferred operations. I write about it in Part 19. When you do e = err.trap(SomeException) and the code makes it to the next line, you can be sure that e == SomeException. So that if statement is unnecessary. However, if the exception doesn’t match the type you pass in, then trap() raise the exception, causing the deferred to move to the next errback in the chain. So if you’re going to use trap in an errback, you need to make sure there is at least on more errback in the chain. If you just want to see whether a failure is wrapping an exception of a certain type, you would use failure.check(PoetryException) == PoetryException. Sorry about the “unformatted” code above. No, it’s self.factory.errback(failure). I wanted to pass the failure object so that I can pass it on to the factory and noticed that was wrong when you mentioned it. I changed it accordingly. Thank you for those important points, I commented the reactor.stop() line and lo, the deferred is indeed being fired! The Print statements are obviously for my “debugging”. I tested these with the reactor.stop() commented and it seems to work. For this exercise, the whole twisted-intro/twisted-client-3/get-poetry-2.py is at http://pastebin.org/978492 just in case someone’s interested. and the errback in the event of a timeout. As of now, the above url does not work, so I pasted my solution here: http://dpaste.org/pmmT/ (thanks to Ed for letting me know). Please note that I think I haven’t actually solved Dave’s exercise here, but this is as close as I can get. the callback from being fired. See what I mean? I am confused about Exercise 1, I have been messing around with it and not having any success… Could you post any tips? How can I share status between PoetryProtocol instances ? It looks like that each PoetryProtocol instance is generated from different instances of PoetryClientFactory. however, I could not figure out how to generate deferred object for each PoetryProtocol instance. state on the factory, or another object referenced by the factory. This is code snippet from this article. In the first figure, factory1 has protocol1 and factory2 has protocol2. In the second, factory has protocol1 and protocol2. but, is this correct as the Factory Pattern …? For client connections it’s common to use a different factory for each one. listening port). You’ll see this in later Parts. ok, I will get forward reading this your tutorial. Hi Dave, I am having some trouble in trying to understand from where the callback is originating. What is the business logic here? When you are initializing factory with callback. What does it mean? I’m really confused. I understood what callback in this case is. It is basically the got_poem() method. We are passing it as a parameter itself. But what I still dont get is if there is an error, how does the get_poetry() method come to know about it? Also why are you comparing len(poems) + len(errors) with len(addresses) ? We find out about the error from Twisted telling us via the clientConnectionFailed callback on the Factory object. Twisted calls that when an attempt to connect fails. And in that case get_poetry arranges for the errback to be called. Since all of our attempts to contact a poetry server will either retrieve a poem or result in an error, when the total number of poems and errors equals the number of servers we are done. and factory is initialized with a callback object and an errback object, which are actually the got_poem() and poem_failed() methods. And if now factory object gets an error, clientConnetionFailed() is called which in turn invokes self.errback(reason) that is the poem_failed(err) method. Have I got the working right? I think you have got it! Another thing, I am looking to write an asynchronous port scanner using twisted. Any ideas how should I start out? I would go through a few more tutorials first, but you already have most of what you need — the clientConnectionFailed is going to be the key to this problem, since it will tell you when you cannot make a connection. Instead of connecting to different servers, you’ll make lots of connections to the same server but different port numbers, and keep track of which ports accept a connection and which ones do not. I know I am late for the twisted party, but anyway here is my question, how different is clientConnectionFailed in PoetryFactory from connectionLost in PoetryProtocol? What I understand is once the connection is established and the poem is downloaded completely connectionLost is called, and if the connection is failed before establishing clientConnectionFailed is called, is that right? According to his concept, I finished the exercise for python 3 and Twisted 17.1.0.